This altimeter is designed for measuring constantly the height of the aircraft above ground, terrain during flight. 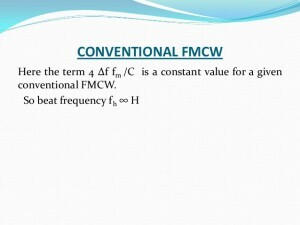 It is also suitable in conjunction with an Automatic Pilot System. 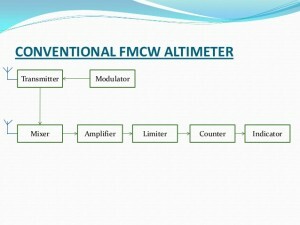 a FM CW radar altimeter. It is supplied with a double Range Indicator, type AYD 3. One for till 400 ft and one for 4000 ft. One ft is equal to 0,3048 meter. So 400 ft is 1,2 km, 4000 ft is 12 km. type SA 1, to switch for the desired altitude of the aircraft. When no Automatic Pilot is used, the Limit Range switch can be used in conjunction with a Limit Indicator, consisting of 3 lamps, red, white and green. All these items are at the dasboard. When not using the Automatic Pilot, a dummy connector is put in the receptable connector at the front of the transmitter/receiver J-106. 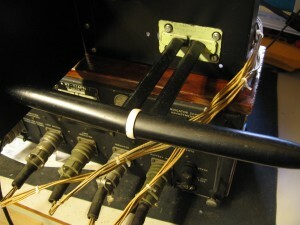 When not placed and still Automatic Pilot is connected to this receptable by a cable, the change over switch on the Automatic Pilot box must be set on manual. When switched to automatic, these lamps have different functions. In my installation that dummy is placed and the functions of the lamps are discribed just below. 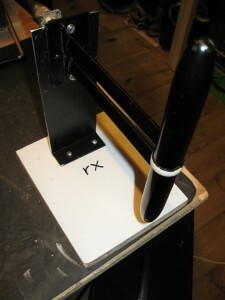 At the Limit Range switch , the height of the aircraft , which is chosen to fly, or providing a flight with save height, can be chosen with the knob on it. 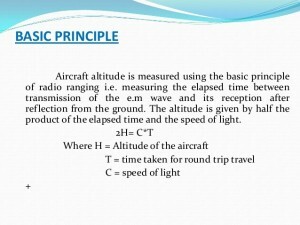 When now the red lamp in the Limit indicator, is lightened, the aircraft is flying beneath the value on the Limit Range switch. When white, the height is about the desired value. 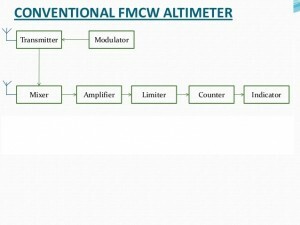 When green, the height is above the value of the Limit range switch, so save height. See also the first picture below. The principle of working is different from the SCR 718. 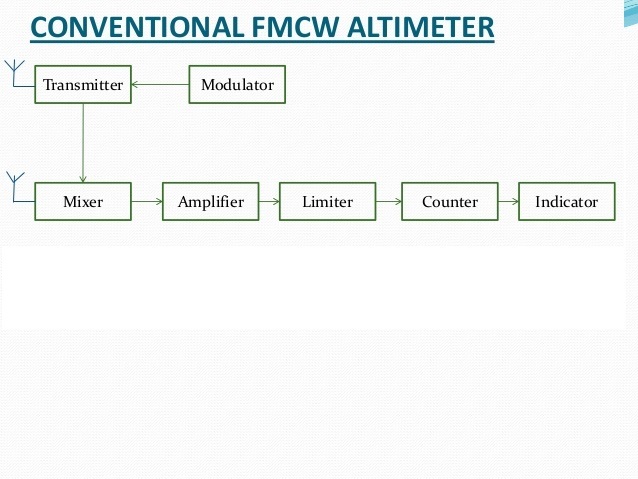 See below the block diagram of the APN-1 Altimeter. 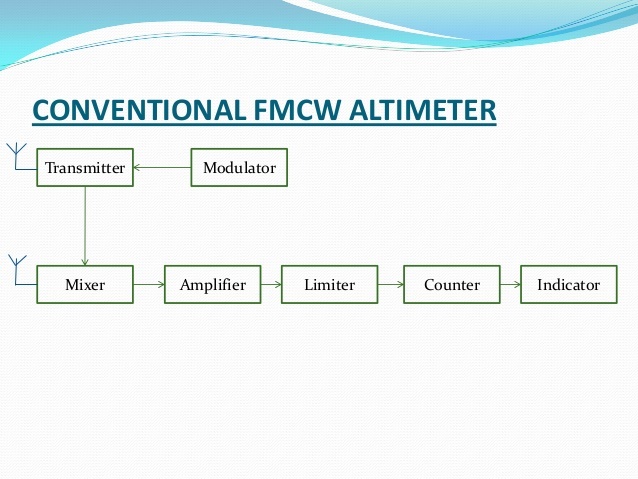 The APN- 1 is a frequency modulated CW Altimeter. It , just like the SCR 718, determines the time required for a radio wave to travel from aircraft to earth and return. 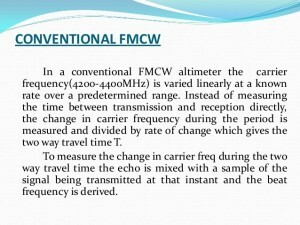 A different method of time measurement is used , which depends on the observed difference in frequency between transmitted and received signal. If frequency of a radio transmitter is changed rapidly at a constant rate (frequency modulation), the transmitter will change frequency in the time required for a radio wave emitted by it to travel to earth and return. 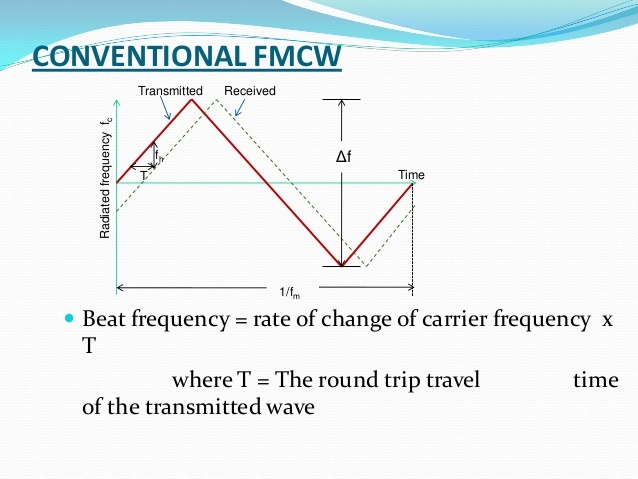 The higher the aircraft, the longer the time required for a round trip and the greater the difference between the transmitter frequency and that of the reflected wave when it arrives at the aircraft. 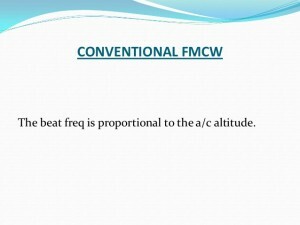 This frequency change is the proportional to the altitude of the aircraft. 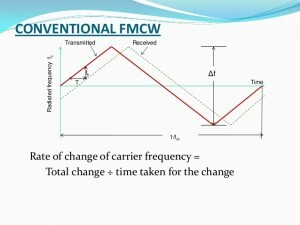 If the rate at which the transmitter frequency carrier varies, is known , e.g. 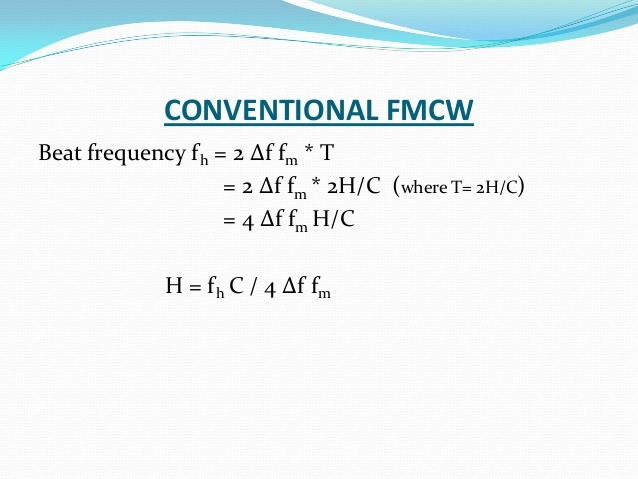 FM modulation, and this signal is also modulated at a rate of 120 cycles, is CW modulation, his frequency is varied from his center frequency of 400 Mhz , between 420 and 460 Mhz at lower altitudes of a maximum range of 4000 ft, the elapsed time corresponding to any observed frequency difference is then established. 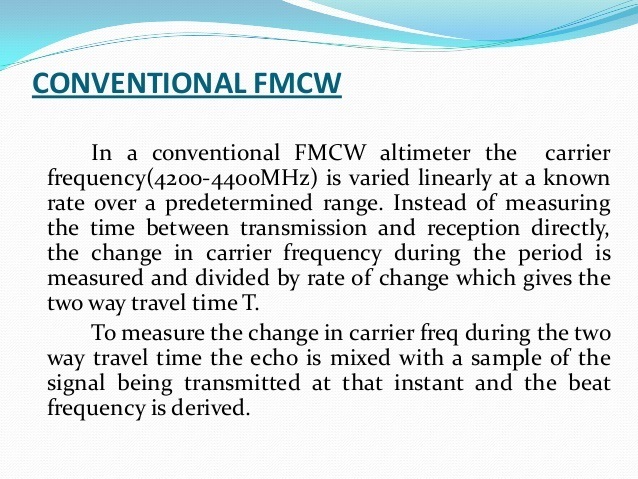 This frequency difference (elapsed time) is converted, in an electronic circuit, which delivers a proportional current to drive a meter instrument, the Altitude Indicator. 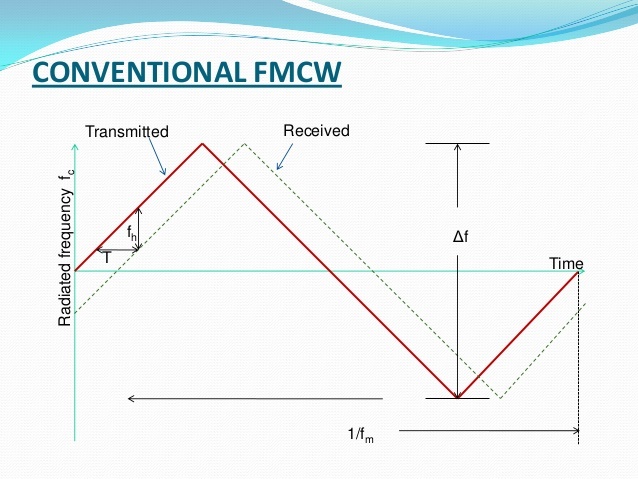 The output of the transmitter is a FM modulated constant carrier of 0,1 watts, which is radiated from a small half wave dipole, located, often, just under the wing of the aircraft. Each wing carries one dipole antenna, one for transmitting, one for receiving. 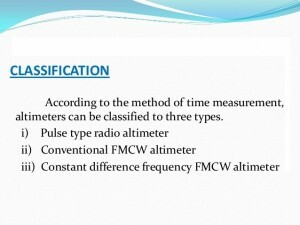 The principle of the altitude measurement in the APN-1 will be discribed in the following presentation below. Above the C is constant all the time, so when T in increasing, H is increasing too. 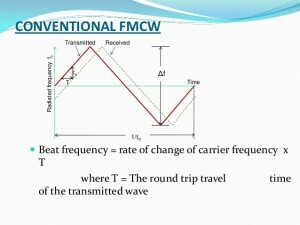 Above: when T is increasing, rate of change carrier frequency is stable, the beat frequency is increasing. 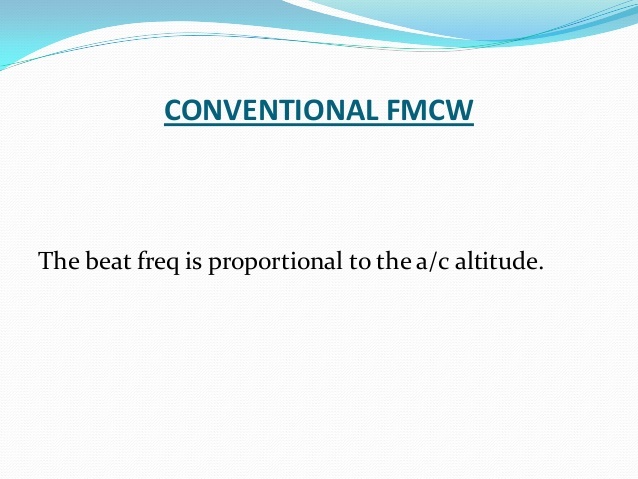 Above means: FM modulation of 40 Mc, CW frequency , and and velocity factor (300.000 km/sec) is stable, then the altitude is proportional to the beat frequency. 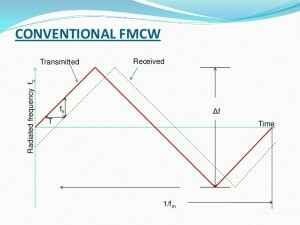 Above the principle block diagram of the APN-1. 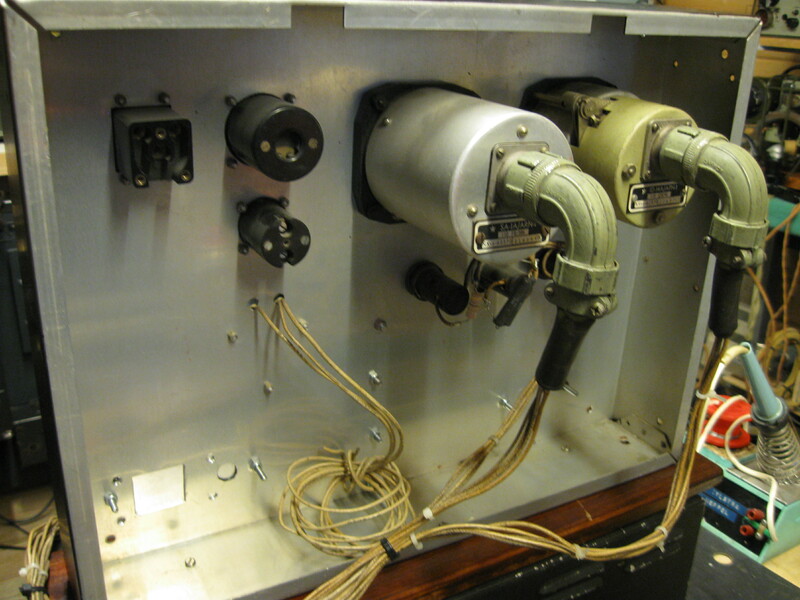 Below some pictures of my APN-1 unit. Just click on the picture to get a bigger one. 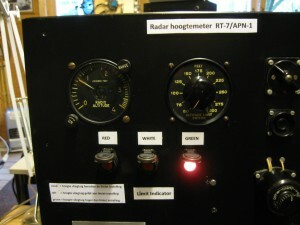 My Altimeter unit RT7 APN-1. 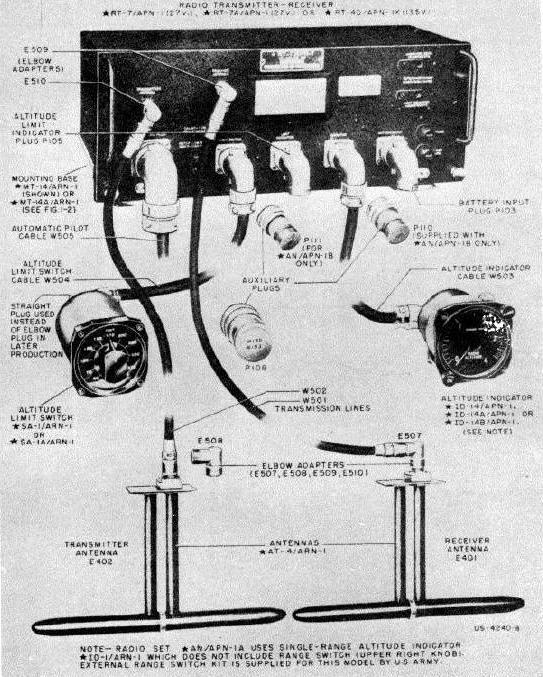 Below the transmitter/receiver. 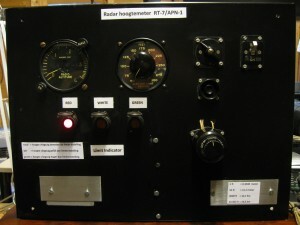 Above left the Altitude Indicator and Range Switch unit. In the mid the 3 lamps of the Limit Indicator. Just below at that, the 2 dipole antennas. 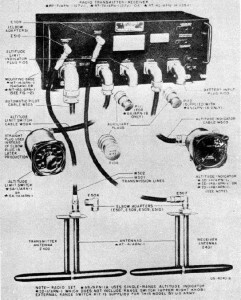 Transmitter/receiver box. 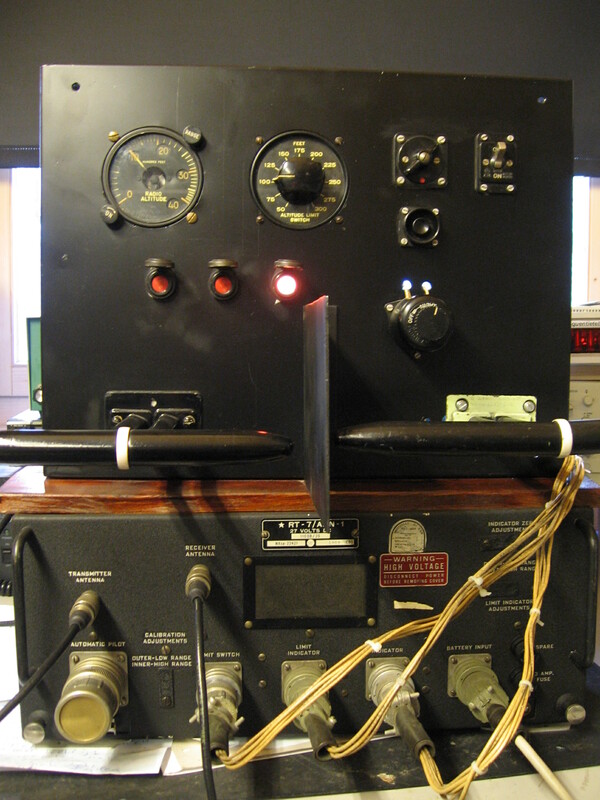 Just watch the inserted dummy connector at the left, when the Automatic Pilot is not in use. Left the height indicator with 2 scales on it. Below the 3 lamps of the Limit Indicator. 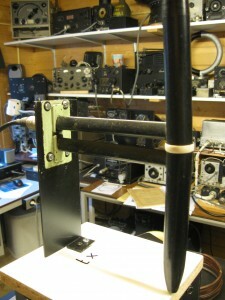 One of the small halve wave dipole antenna. 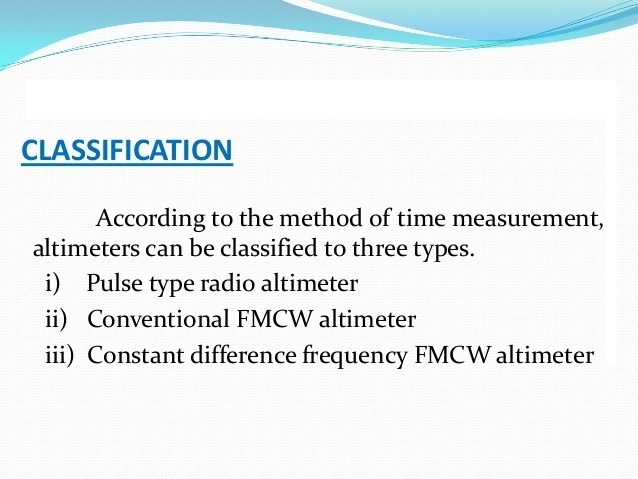 Comparison of FM and Pulsed Altimeters. They are designed for different purposes. 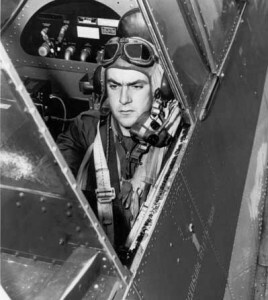 For instance for bomber aircraft, flying at great altitude and for fighter planes flying often at lower altitude, for attacking objects at ground level. 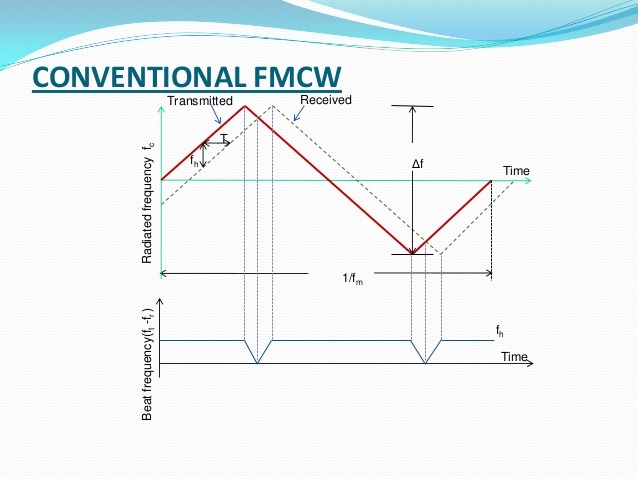 Fighter planes use often the FM units, while bomber planes use the pulsed altimeters. 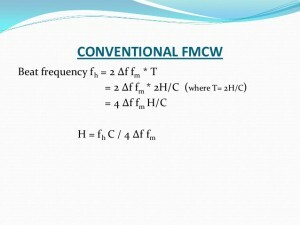 The FM unit has a very small fixed error while the pulsed unit has negligible percentage error. 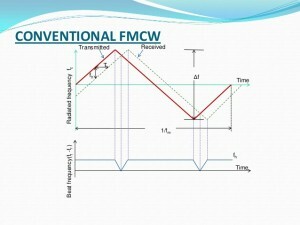 The FM unit is intended for better measurement at low altitude, while the pulse unit is better at very high altitudes. 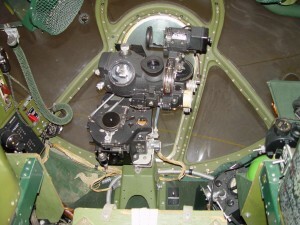 Often you can see at pictures, taken in bombers, like B17 or B 29, the indicator unit of the SCR 718 , type I-152, is to be seen. See picture below. Just right down to be seen the I-152 indicator at the Bombardier position in a B -29 aircraft. 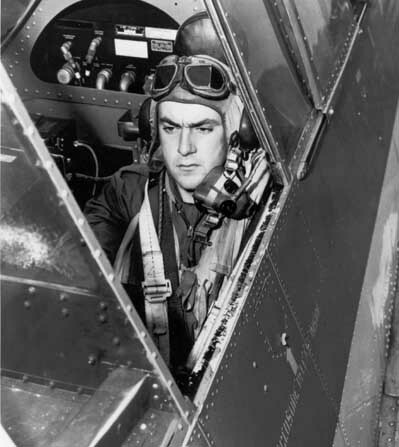 Here to be seen in the background, the APN-1 transmitter/receiver, in a fighter plane. In the week of the 28-th of march, 2018, I changed the instrument panel of the altimeter. First, I did not like after all , the antennas being mounted on it and second because if I put the antennas on a separate mounting, the demo of the altimeter went better. 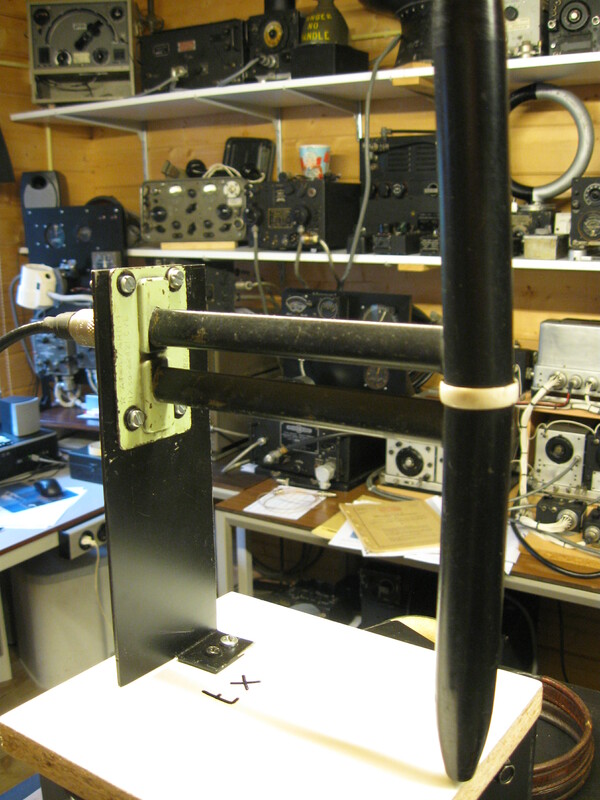 The transmitter antenna at 400 Mc. 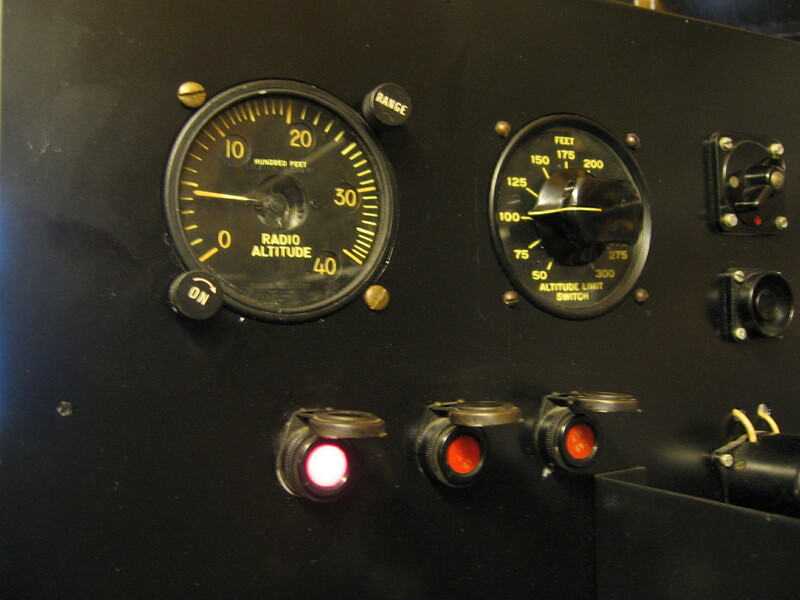 The red lamp is lighten, that is correct, because the needle of the altimeter indicator is above the installed value of 50 ft at the limit switch. 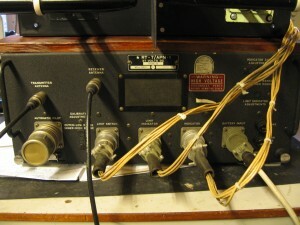 The back side of the panel. Note the rare connectors at the instruments. The demo is going very well, if you move the receiving antenna. 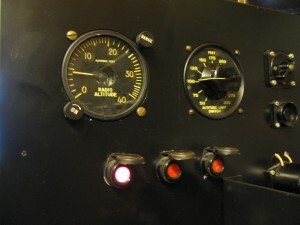 The indicator meter and the lamps are responding very quickly. This is correct, because at the functioning of the altimeter at ground level is always very unstable. At bigger altitudes it is more stable. Posted in AAF Altitude Receivers.